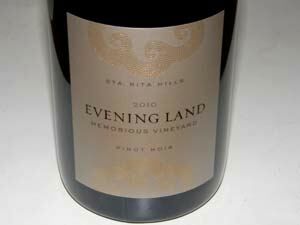 Evening Land Vineyards is an ambitious project, releasing Pinot Noir and Chardonnay from Seven Springs Vineyard in the Eola Hills of the Willamette Valley of Oregon, from vineyards in the true Sonoma Coast, Edna Valley and Sta. Rita Hills of California, and Bourgogne from Burgundy. Evening Land organically farms over 120 acres, producing 13 Estate wines. The vineyards contain a mix of old vine rooted Oregon and California heritage clones, cuttings from established vineyards in Burgundy and include an experimental block of Pinot Noir from seed. 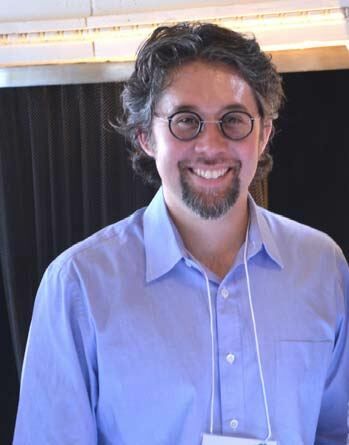 In Oregon, consulting winemaker Dominique Lafon works with winemaker Isabelle Meunier, and winemaker Sashi Moorman (photo below) leads his team in producing the wines from California. Moorman is a former chef got his start at The Ojai Vineyard. In 2012, UC Davis graduate Erin Miller joined Evening Land as the assistant winemaker at the Lompoc winery. He apprenticed in Burgundy and spent seven years working in the Sonoma Coast and Sta. Rita Hills before joining Evening Land full time. The Evening Land wines are divided into four groups, designated by the color of the label. The Blue Label wines in 2009 consist of an Oregon and California Pinot Noir, a California Chardonnay, and Etiole Bourgogne Rouge and Blanc from Burgundy. The Silver Label designates more focused wines including in 2009 a Sta. Rita Hills Pinot Noir, a Doc’s Ranch Sonoma Coast Pinot Noir, a Seven Springs Estate Pinot Noir, and an Auxey Duresses Chardonnay from Burgundy. The Gold Labels signify monopole estate wines from three vineyards in the Sta. Rita Hills, a Pinot Noir and Chardonnay named La Source from Seven Springs Vineyard, and a Beaune Bressandes Premier Cru Pinot Noir from Burgundy. The wines with White Labels are “pinnacle examples” of a vineyard and in 2009 consisted of an Occidental Vineyard Sonoma Coast Pinot Noir and a Seven Springs Vineyard Summum Chardonnay and Pinot Noir. 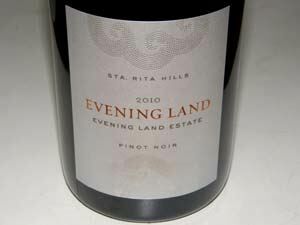 The Evening Land Estate Vineyard in the Sta. Rita Hills provided four of the 2010 Pinot Noirs. Tempest, Memorious and Bloom's Field are all block selection wines from that vineyard. The 40-acre vineyard was planted on a previously untouched western edge of the appellation in 2007. The first vintage was 2009. The 2010 growing season was very cool with only one day breaking 80 degrees between bud break and harvest. The crop was light due to shatter and the desire not to push the young vines too hard. Harvest commenced during the first week of September and finished by the end of the second week. Chemistry was ideal with low sugars, low potential alcohols, excellent acidity and highly concentrated levels of ripe polyphenols. The wines showed intense colors and rich flavors. Whole clusters are included in fermentations in some cases and fermentations are indigenous. Pressing is gentle with a closed pneumatic press, with very little press wine going to barrel. A racking is done in the winter before bottling to emphasize an opulent mouth feel. After 12-14 months in French oak barrels, the wines were bottled without fining or filtering. New oak is less than 25% and in some cases, less than 10% of the total cooperage. All the 2010 wines reviewed here were well-crafted with deep color, dark fruits, moderate tannins, bright acidity, and a rich mouth feel. In some wines, the sheer volume of fruit flavor was impressive without over-extraction or jamminess. The Sta. Rita Hills Estate Vineyard wines are impressive considering it is only the second vintage from this vineyard. The only shortcoming of the wines was that there was not a whole lot to distinguish them from each other. A tasting room is open in the Lompoc Wine Ghetto Friday through Sunday from 11:00 AM to 5:00 PM. In Oregon, visit by appointment in Salem at 572 Patterson St. NW, St 170 (contact ib@elvwines.com). The wines are available through the Evening Land website at www.eveninglandvineyards.com. 13.5% alc., 429 cases, $35, released summer 2012. 20% whole clusters. Vineyard is 2 miles from the Pacific Ocean sheltered behind the coastal range. The soils are diverse and well drained. Shorter fermentations and longer pressing with more of the press wine taken to barrel with the free run wine. New oak less than 25%. · Dark reddish-purple color in the glass. Nicely perfumed with scents of darker berries, plum, oak spice and violets. Middleweight, appealing flavors of blackberries, black currants, and sweet plums, engaged by supple tannins and bright acidity, with a slight oak undertone. Easy to drink with excellent balance and a seductively satiny mouth feel. Very good. 13.0% alc., 652 cases, $45, released summer 2012. Vineyards planted with tight spacing using California heritage clones exclusively. Representative of diverse vineyard blocks. · Dark reddish-purple color in the glass. Aromas of black berries, black grapes, tea leaf, dried herbs and mushrooms. Exotic and savory with an enjoyable core of fresh dark berries and a soft note of citrus-flavored cranberries on the finish. The wine was significantly better the following day from a previously opened and re-corked bottle showing more expressive fruit and less savory aromas and flavors. Very good. 13.0% alc., 88 cases, $60, released summer 2012. A blend of Swan and Calera clones. From a warm part of the vineyard protected from the wind by a large rock outcropping to the west. · Dark reddish-purple hue in the glass. Terrific nose offering aromas of fresh, ripe black raspberries and blackberries with a hint of forest floor in the background. Moderately rich with lasting flavors of blackberries and black currants with a subtle herbal oak imprint. The fruit is pulled into line with firm, ripe tannins and wellintegrated acidity, and offers a flamboyant display on the finish. Even better the following day from a previously opened and re-corked bottle. Very good (+). 13.0% alc., 114 cases, $60, released summer 2012. From a cool vineyard block due to exposure to winds from the Pacific Ocean. The soil is clay loam and rich in iron. Because there were many shot berries, the clusters were de-stemmed. A long cold soak was employed and a slightly extended maceration at the end of fermentation enriched the tannins. New oak less than 10%. · Deep, dark reddish-purple color in the glass. Fairly nondescript nose with a hint of dark berries. Vibrant fruitiness with flavors of blackberries and boysenberries fanning out nicely on the palate and finishing with some strength and persistence. The wine is fresh and lively due to bright acidity but is burdened with considerable rustic tannins at this stage. It is a bit muddled and brooding, especially on the nose, and may benefit from more time in bottle although it tasted the same the following day from a previously opened bottle. Good. 13.5% alc., 122 cases, $60, released summer 2012. Last part of vineyard to be harvested and the vineyard's most vigorous wine. The name comes from the seedling block that resides inside it. 7,000 seedlings planted, taken from Evening Land vineyards in Sonoma. Because these seedlings display the genetic diversity of Pinot Noir, they represent the "memory" of Pinot Noir. The fruit from these seedlings was not included in this wine. A little more new oak but less than 10%. Indigenous yeast fermentations. · Dark reddish-purple color in the glass. A generous array of purple and black fruit aromas with a complimentary hint of spice and oak, taking on more intensity over time in the glass. Very tasty blackberry core which enters with aplomb and expands in the mouth, filling every nook and cranny. A slight fresh citrus-driven acidity in the background gives the wine lift and a savory note adds interest. This one really grows on you over time. The following day when tasted from a previously opened and re-corked bottle, the evocative fruit had picked up intensity and the aromatics were still fresh and lively. This wine is a real attention-getter.